Budicort Nebuliser Suspension 0.5 : Each 2 ml ampoule contains Budesonide BP 0.5 mg.
Budesonide is a synthetic corticosteroid having potent glucocorticoid activity and weak mineralocorticoid activity. It has approximately a 200-fold higher affinity for the glucocorticoid receptor and a 1000-fold higher topical anti-inflammatory potency than cortisol. Corticosteroids have been shown to have a wide range of inhibitory activities against multiple cell types (e.g., mast cell, eosinophil, neutrophil, macrophage, and lymphocyte) and mediators (e.g., histamine, eicosanoids, leukotriene, and cytokine) involved in allergic mediated inflammation. 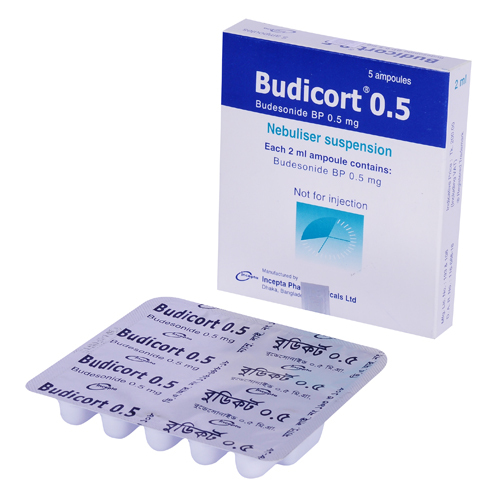 Budicort nebuliser suspension is indicated for the maintenance treatment and as prophylactic therapy of asthma. Children 3 months to 12 years of age: 0.5 - 1 mg twice daily. Adults and elderly: 1 - 2 mg twice daily. Sneezing, headache, sore throat, dry mouth, nausea etc. have been reported as the common side effects. Budesonide nebuliser suspension should be used with caution in patients with active or quiescent tuberculous infection, untreated fungal, bacterial, or systemic viral infections, or ocular herpes simplex infection. Pregnancy: There are no adequate and well-controlled studies in pregnant women. Budesonide nebuliser suspension, like other corticosteroids, should be used during pregnancy only if the potential benefit justifies the potential risk to the fetus. Lactation: It is not known whether Budesonide is excreted in human milk. Because other corticosteroids are excreted in human milk, caution should be exercised when Budesonide nebuliser suspension is administered to nursing women.